How much illegal streaming and downloading is going on in the European Union? A report on film-watching habits released last week by the European Commission suggests that it’s quite a lot. 4,608 people ages 4 to 50 from 10 European countries were surveyed. Nearly all — 97 percent — say they watch movies at least occasionally. 68 percent of them say they download or stream movies for free, and about half of that group (34 percent of respondents overall) do so weekly. 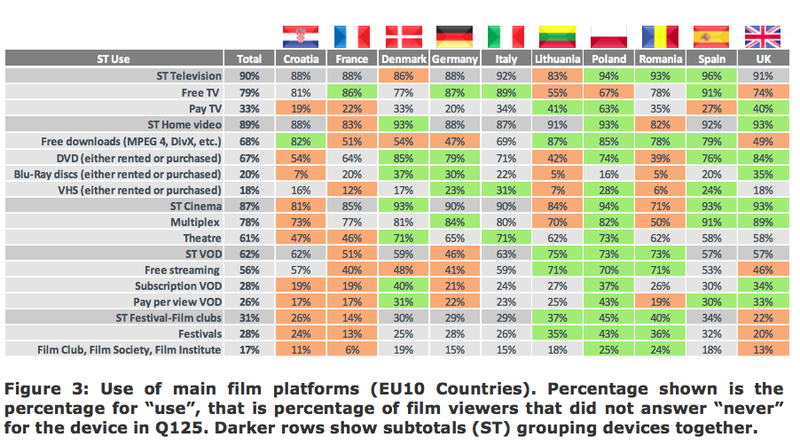 The full report — much of which focuses on ways that the European film industry can reach more viewers — is here as a PDF. I don’t pirate, but that’s mostly due to my strange tastes in music and TV. Haven’t watched a movie at my own home in years, TV or on PC. All the music I listen is from online radio stations. I also use Linux, not Windows (I wouldn’t buy it because it’s lousy, and would cost me half my monthly paycheck for the OS alone). For games I have a PS3 with a few dozen bought games. Software … Linux over Windows, usually means open source over proprietary. Here an European, Spanish one. First of all, IMO country isn’t illegal to download or free streaming films (yet). I would like to have a good streaming service or a affordable buying service, but it seems impossible. Netflix is a no-no here (due to enormous copyright prices, Netflix itself said). iTunes aside of being extremely expensive only have movies, and other services only stream translated ones, so we have to wait not only usual months between premiere and VOD time, but also some more time to translate it. Here there are millions of people (almost 25% of adult people) without a job, and many of them since 2-3 years, but prices only go up and up. So, there are a lot of people who can’t pay but those are the people who have more time to watch films and series…(free tv is a no no option here, unless you want to watch 10 years old movies or go hunting tv shows through the day, since they usually change air date from day to day). And those of us who can pay can’t find a service that have a (not even good) not too bad catalogue. I’m paying now a Streaming service (StreamNation) in order to upload my rip DVDs and others I download, so I would be happy to pay for a good service that allow me to do the same kind of things: streaming, offline view, etc, but I can’t find one. I know that viewing us from outside maybe we seem a band of pirates, but you must to live here and find which options we have (actually, don’t have) to really understand what is happening. Do you also shoplift in stores because you don’t like the prices? Just curious. No, because there are shops where I can buy. What you don’t seem to understand from my comment is that we DON’T have normal “shops” for multimedia content. Using life examples, I can pay a McDonalds hamburger and maybe not a dinner at Hilton Hotel, but I can eat, but in multimedia we only have “Hilton” for multimedia and shops with out of date food. And yes, there are people who have to shoplift because they are without any income from maybe 3-4 years ago. It’s a very sad thing to watch someone stealing bread for their children. I repeat I would like to pay someone for a good streaming service instead of makin my own one as today, but no one offers it to me. Have you read what I wrote about Netflix? They tried to enter here and had to abandon the idea because copyright owners (not creators but owners of the rights in Spain, even for american films) wanted absolutely crazy payments. You can search for Netflix press communicate if you want. Do you know I can buy a DVD in UK, even with sending rates, for less than half the price the same DVD in my own country? Do you know a Big Bang Theory of about 25-30 minutes have here about 45 minutes of commercials into it and if I try to pay for not having that I can find one service that offers it to me (at least you the episode you wanted to watch is one from a season 2-3 years old)? I repeat you again: I want to pay, but no one wants my money. It’s easy to criticize when you have options, but try to live without them.